The Quietus | News | Savages To Play Lisztomania Screening! Savages To Play Lisztomania Screening! 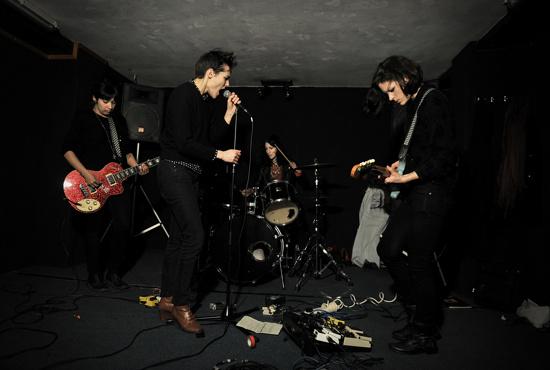 Recently hailed by the Quietus' own Luke Turner for displaying "more aggression, desire and determination than pretty much every guitar group you're likely to see in 2012", rising London quartet Savages will bring their sonic skills to Notting Hill's Gate Picturehouse cinema on Saturday March 17, as part of the ongoing, capital-wide Ken Russell Forever season. The gothic post-punkers are due to perform (start time 11.30pm) before a late night outing for the late director's 1975 baroque 'n' roll extravaganza Lisztomania, which features Roger Daltrey as a fantastical version of 19th century composer Franz Liszt. Paul Nicholas stars as Richard Wagner and Ringo Starr is the Pope, while soundtrack provider Rick Wakeman has a turn as Thor.